Batman vs Superman is set to release in March 2016 and every passing day fans are looking for any teasers or additional trailers for the film. Although not a lot has come out since the release of the trailer and the accompanying announcement that Wonder Woman would have a large part in the movie as well as in Warner Bros. merchandising for the film. Fans got a little teaser when first official synopsis of Batman vs Superman was released during the Licensing Expo on June 9th. Fearing the actions of a god-like super hero left unchecked, Gotham City’s own formidable, forceful vigilante takes on Metropolis’s most revered, modern-day saviour while the world wrestles with what sort of hero it really needs. And with Batman and Superman at war with one another, a new threat quickly arises, putting mankind in greater danger than it’s ever known before. This synopsis has many fans wondering if the earlier reports that Doomsday will be in Batman vs Superman will be true. This also goes to show that Luthor may not be the exact reason why Batman and Superman begin their war against one another. Superman and Batman have traditionally been the most iconic and famous superheroes this world has ever seen. They are so well known across the globe that people who do not have the option to even buy the comics, games, or movies are aware for who the are and what they stand for. That is why, as this movie begins to get closer to the premier date and as more and more information comes out about it, people will be excited. This is the first time in cinema history that Batman and Superman will be meeting in a live-action movie. Through all the suspicion though, the writers at DC Comics began to realize that they may be better friends than enemies and began the storyline that would continue today where the Man of Steel and the Dark Knight become what many would say best friends. 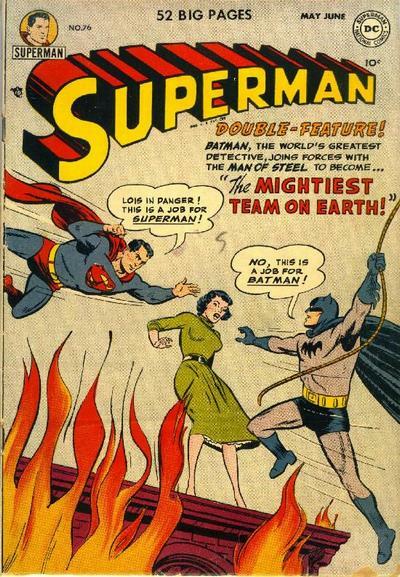 The world's finest team; where an almighty being sees a mere mortal as his equal. Due to the history of this friendship beginning with the two always duking it out, it only seems right for Zach Snyder to start of DC Comics new cinematic universe with a bang with Batman vs Superman. It also only seems right that the way they bring themselves together within the film is not by talking it out or discussing things but to have a greater threat arise to take them both on where they will see that they can be partners and friends. This is why the synopsis should be more telling that what many fans think. This is not only the obvious story line of whats to set up Justice League in the future but is also a story line that will bring the most iconic heroes as well as the best written comic friendship to date to the big screen. Only time will tell whether the greater threat that arises is in fact from Doomsday but there is one thing for sure, as information comes out about this movie, fans are getting more and more excited to see what the new DC Cinematic Universe will be like.